Leslie "Les" Moonves is president and chief executive officer of CBS Corp. The CBS board of directors said Friday it would investigate allegations of personal misconduct against legendary CBS chief executive Leslie Moonves, based on a story in the New Yorker that states he sexually harassed six women over three decades. The New Yorker piece said four of the women described forcible touching or kissing during business meetings. Two of them said Moonves physically intimidated them or threatened to derail their careers. The inappropriate behavior began in the 1980s and continued through the 2000s, the magazine said. "What happened to me was a sexual assault, and then I was fired for not participating," the actress and writer Illeana Douglas was quoting as saying by the magazine. The story was written by Ronan Farrow, who has been key in revealing entertainment and political figures accused of sexual misconduct, including Harvey Weinstein. Shares of CBS plunged on Friday, dropping more than 6 percent in regular trading. In a statement, Moonves said, "Throughout my time at CBS, we have promoted a culture of respect and opportunity for all employees, and have consistently found success elevating women to top executive positions across our company. I recognize that there were times decades ago when I may have made some women uncomfortable by making advances. Those were mistakes, and I regret them immensely. But I always understood and respected-and abided by the principle-that 'no' means 'no,' and I have never misused my position to harm or hinder anyone's career. This is a time when we all are appropriately focused on how we help improve our society, and we at CBS are committed to being part of the solution." The New Yorker story included a line, attributed to CBS, which stated there have been no misconduct claims and no settlements against Moonves during his twenty-four years at the network. The magazine also asserted that 30 current and former employees of CBS said inappropriate behavior occurred in other parts of the company, including CBS News and 60 Minutes. The piece included allegations that Jeff Fager, the executive director of 60 Minutes, tolerated harassment of women, protected men accused of misconduct and, while inebriated at company parties, himself had touched women in ways that made them feel uncomfortable. Fager denied that he had inappropriately touched women. In a statement to the New Yorker, he added, "It is wrong that our culture can be falsely defined by a few people with an axe to grind who are using an important movement as a weapon to get even, and not by the hundreds of women and men that have thrived, both personally and professionally, at 60 Minutes." He also said, "A majority of our senior staff are women. All of them worked their way up the ranks and are now managers of our broadcast. Half of our producers and a majority of our associate producers are women. It is a challenging place to do well and promotions are earned on merit and are not based on gender." CBS said in a statement sent to the Post: "CBS is very mindful of all workplace issues and takes each report of misconduct very seriously. We do not believe, however, that the picture of our Company created in The New Yorker represents a larger organization that does its best to treat its tens of thousands of employees with dignity and respect. We are seeing vigorous discourse in our country about equality, inclusion and safety in the workplace, and CBS is committed to being part of the solution to those important issues." The news has the potential to rock the entertainment business landscape. Moonves is currently in pitched battle over the future of his company with Shari Redstone, the National Amusements chair with controlling shares in both CBS and Viacom. Redstone wishes to recombine the companies to better compete with Silicon Valley players. Moonves wants a reunion to go forward under very specific conditions, including one in which he and his deputies would retain executive control of the combined unit. 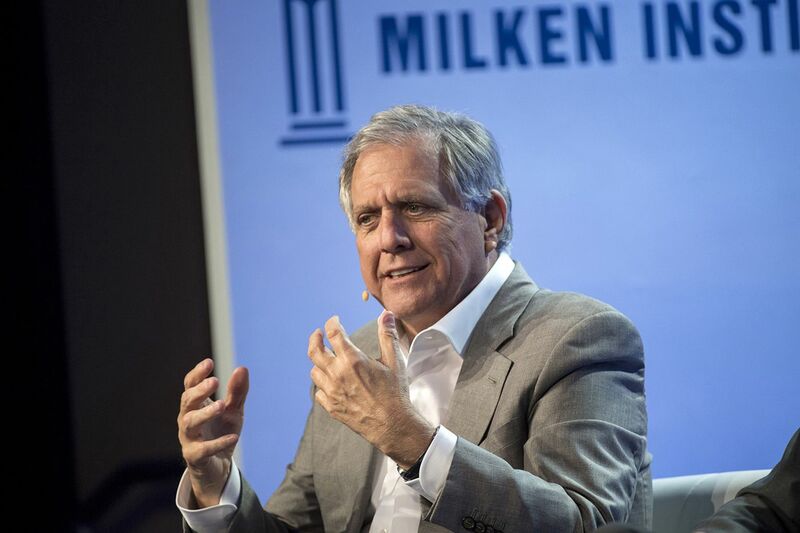 If Moonves is removed as a result of the investigation, the chances of a Redstone-directed merger of CBS and Viacom would dramatically increase, analysts said. "I think there's still a lot we don't know about the investigation. But this clearly is going to get entwined in the battle with Shari Redstone and, if Les Moonves is removed, significantly enhance her leverage and chance to move forward with the strategic plan," said Tuna Amobi, a senior equity analyst at CFRA Research who closely follows both Viacom and CBS. The battle between Redstone and Moonves has only intensified of late. In May, Moonves' CBS sued Redstone to stop her from taking control of company. Redstone promptly sued back. The CBS board announced its investigation into Moonves before the New Yorker had published its piece Friday evening. Hours earlier, the Hollywood Reporter published a story that said Moonves was set to be accused in magazine. "All allegations of personal misconduct are to be taken seriously," the company said in a statement Friday afternoon. "The independent directors of CBS have committed to investigating claims that violate the company's clear policies in that regard. Upon the conclusion of that investigation, which involves recently reported allegations that go back several decades, the Board will promptly review the findings and take appropriate action." One of the most vivid accounts in the New Yorker piece came from Douglas, who said Moonves grabbed her and violently kissed her during a meeting in 1997. "What it feels like to have someone hold you down-you can't breathe, you can't move," she told the magazine as she recounted an alleged assault by Moonves. "The physicality of it was horrendous." Douglas said she was later fired from the show because she had rebuffed Moonves' advances and was also fired by her manager and agency, CAA, as a result. She said she felt she had no recourse at the network, which was run tightly by Moonves. She was later rehired for a CBS movie, she believes, as a form of quid pro quo for not pursuing a lawsuit, according to the magazine. CBS denied to the New Yorker that there was any quid pro quo with Douglas. CBS added that Moonves acknowledged trying to kiss Douglas, but that "he denies any characterization of 'sexual assault,' intimidation, or retaliatory action." Other women also stepped forward to accuse Moonves of sexual misconduct include the writer Janet Jones, who alleged a physical attack by Moonves from which she was forced to flee, and the producer Christine Peters, who described an unwanted advance from him in a business meeting. Whatever the outcome of the board's investigation, it threatens to tarnish the legacy of a modern media giant. A former actor, Moonves held jobs at 20th Century Fox Television and Warner Bros. Television earlier in his career, and was instrumental in shows such as Friends reaching the air. But it was when he arrived at CBS in 1995 — he would become CEO in 2003 — that he entered the top tier of executives, almost singlehandedly ushering in a golden era at the network. Moonves has been behind hit franchises such as CSI that, while hardly critics favorites or youth-skewing hits, have helped the network finish highest in total viewers for 15 of his 16 years. The network narrowly eked out a win over NBC this year, marking its tenth consecutive win atop the ratings leaderboard, though NBC finished higher in the coveted 18-49 demographic. Moonves also oversees Showtime and a film division, among other assets. In recent years Moonves has sought to preserve the network's lucrative stream of advertising dollars from traditional television — he gave an impassioned speech for it at this year's network upfront in May — while also delicately trying to bringing it into the future. Under Moonves, the company has launched CBS All-Access, a streaming service on which coveted shows such as Star Trek and The Good Fight primarily live. Without Moonves at the helm, CBS' fortunes are uncertain. The company's second-in-command is chief operating officer Joseph Ianniello, who does not have a track record as the head of a large media company. CBS noted the battle with Redstone in its statement Friday. "The timing of this report comes in the midst of the company's very public legal dispute. While that litigation process continues, the CBS management team has the full support of the independent board members," the statement said. Redstone, interpreting the note about the timing as suggestive of a potential conspiracy, fired back with a statement via spokeswoman Sara Evans. "The malicious insinuation that Ms. Redstone is somehow behind the allegations of inappropriate personal behavior by Mr. Moonves or today's reports is false and self-serving," the statement said. "Ms. Redstone hopes that the investigation of these allegations is thorough, open and transparent." Moonves has been married to Julie Chen, an on-air personality and producer for CBS, since 2004. He is not the only prominent figure at CBS to face allegations of inappropriate conduct. In November, the Washington Post published a story saying Charlie Rose made unwanted sexual advances toward eight women. In May, the Post published a follow-up piece stating an additional 27 women said Rose sexually harassed them. The Post also found three occasions over a period of 30 years in which CBS managers were warned of Rose's conduct toward women at the network. Last year, Rose apologized in a statement provided to the Post saying he "behaved insensitively at times." His namesake PBS show was subsequently canceled and he was fired from CBS. Rose's responded to the allegations in the Post's May story in a one-sentence email: "Your story is unfair and inaccurate."